Similar to the Center for Entrepreneurship’s New Venture competition, the Hult Prize Challenge has students answer a question by pitching their business solution to a panel of judges. How would you change the world with $1 million? The Hult Prize Challenge provides University of Nebraska–Lincoln students the opportunity to answer that question and compete in the first stage of an international competition for the chance to win $1 million. The deadline to register a team is November 11. Planning the first Nebraska Hult Prize campus competition, Gloria Mwiseneza, a junior integrated science major, from Kigali, Rwanda, brought the competition to campus. Acting as the university’s Hult Prize campus director, she partnered with the Center for Entrepreneurship and the Husker International Business Club to host the event. Open to all majors, this year’s challenge asks competitors to develop an idea to provide meaningful jobs to 10,000 young people within the next decade. Working in teams of three or four members, students pitch their plan to a panel of judges. Those who do not have a team may register individually and are placed on a team. The challenge runs in a bracket format through a preliminary and final round. The three best teams compete in the final round. The Hult Prize Challenge comes to Nebraska on November 16. The winners of the challenge will move on to one of 15 regional rounds around the world. The winner from the competition at Nebraska bypasses the traditional application process to enter the global contest and fast tracks their idea to one of fifteen regional rounds of competition held around the world. From there, winning teams will compete in an international competition at Hult Castle in London, before moving on to the Hult Prize final, where six teams will pitch their ideas at the United Nations in New York. There will be two information sessions on Thursday, November 1 at 12-1 p.m., and on Tuesday, November 6 at 5-6 p.m., both in the Center for Entrepreneurship (HLH 315). 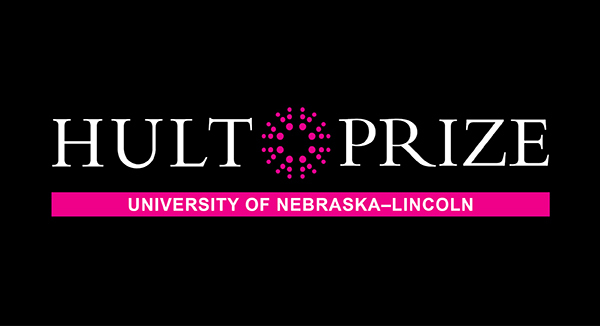 Students can email questions to unlhultprize@outlook.com. The university’s challenge takes place on November 16 in Howard L. Hawks Hall 018. Check in begins at 9 a.m. The first round of pitches happen that morning with the final round in the afternoon and winners announced at 4 p.m. To register a team for the event, visit: https://business.unl.edu/hultprize.